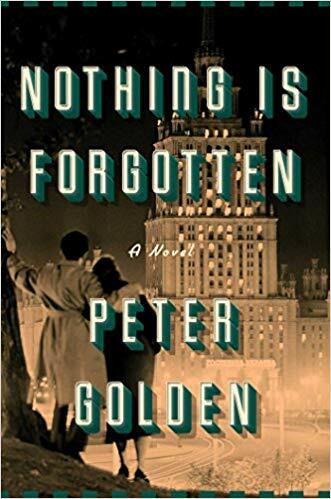 I was quite pleased to accept a copy of Nothing is Forgotten by Peter Golden from TLC Book Tours at no charge for my honest review. Nothing is Forgotten is a well crafted and deeply engrossing tale of a young man’s journey of discovery through a family history that was unknown to him. Michael had a pretty typical American upbringing; his parents owned a candy shop and his grandmother was there to care for him. He loves Rock and Roll and in all ways was living like any normal kid. Using some connections he soon turns his love of music into a job spinning records as a DJ and becomes known as “the mad Russian.” Then his grandmother is murdered and his life is turned upside down. People around Michael feel that his life is in danger so they suggest he take an offer to work in Berlin. While overseas Michael starts to follow a trail that shows him parts of his grandmother’s life that he knew nothing about. He learns things about her and her family that shake the foundation of everything he knows about his family. He also finds himself caught up with a mysterious woman who helps him learn more about his grandmother and ultimately leads him to the answers he seeks about who killed her and why. I found Nothing is Forgotten to be a hard book to put down. The characters are complicated and conflicted; there is much evil to be found in any novel that explores the impacts of Holocaust but there is also goodness as many people did what they could to battle the forces of hate. This book moves back and forth in time sharing Michael’s tale in the present with his grandmother’s life in the past. There are no easy answers and this book doesn’t leave you with a clean and tidy ending. It does stay with you for days after you finish, popping into your thoughts at odd times.